The ridge of Buachaille Etive Beag. 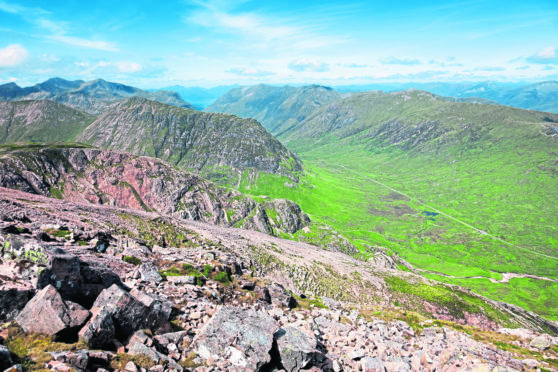 A modern-day battle is brewing in Glencoe over plans for a river hydro scheme in the Highland village – 327 years after the infamous massacre involving two Highland clans. Objectors have been left “appalled” over the proposal for the development near to a site of massive historical interest. They also claim it will impact on wildlife and tourism. The National Trust for Scotland last night said it was “scrutinising” the application, while Scottish Natural Heritage said it had no objections. More than 38 MacDonalds of Glencoe were murdered by Government troops led by Robert Campbell of Glenlyon. The slaying followed a Jacobite uprising in the Highlands with many clans defying orders to pledge support to King William II. Murders were carried out across the glen at MacDonald settlements after the clan chief failed to meet a deadline to state his allegiance to the King. Energy firm Glen Hydro, part of vento ludens Ltd, has lodged plans to construct a river hydro scheme, including intake, buried pipeline, turbine house, outfall, grid connection and access tracks. The plans have met with fierce opposition from local residents, particularly as the turbine location sits just 200 yards from the ruins of Inveriggin House, one of the first locations attacked in the massacre, killing around nine MacDonalds at that site alone. Iain Thornber, the deputy Lord Lieutenant, said: “No archaeological or walk-over survey appears to have been undertaken where ground disturbance will take place. “For a glen known across the world for the infamous and high profile historic massacre – part of which occurred within the boundary of the proposed development area, I find it both astonishing and appalling that the applicant [and] the developer imagined this to be unnecessary. He claimed it would also lead to a loss of and disturbance to wildlife, including nationally rare wildcats, otters and pine martens. Diarmid Hearns, head of policy at the National Trust for Scotland, said: “Since the 1930s, the National Trust for Scotland has campaigned for the balanced development of Glencoe, conserving its important historic character and natural beauty, while supporting access and appreciation of this important glen. Nick Forrest, senior project developer for vento ludens, said: “The location of the ruin at Inveriggan was a significant consideration in selecting the turbine house site, 150m away on the opposite side of the Inveriggan Burn. “A house stood very close to the turbine house site until the mid-1970s, and the turbine house will be slightly further from the public footpath. “The turbine house will not change the current setting of the Inveriggan ruin.